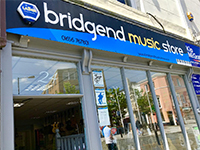 Bridgend Music Store has been open and trading since October 2011 but was previously a well established and successful musical instrument shop, under different ownership, for over 20 years. 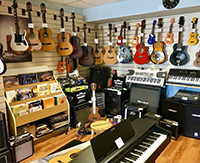 We provide a friendly, professional and knowledgeable service dealing with a wide range of beginner to professional musical instruments, accessories and products. The shop is conveniently situated in the centre of Bridgend in a newly pedestrianised area with easy links for both bus and rail and plenty of local parking. We are constantly updating our stock list, so if you don't see what it is you are looking for or have any questions on our products, just give us a call and we will be more than happy to help with your needs. From Cardiff: take the M4 west. At junction 35 turn south on the A473 and head for the Town Centre. By Train or bus: We are just 300 yards from the railway station (follow Station Rd. and Wyndham St.) and less than half that from the main bus station. Although Dunraven Place is a pedestrian area we are very closely situated to public transport facilities and affordable parking.